Croatia can indeed be proud of its abundance of birds in the protected area of Crna Mlaka, Lonjsko Polje, and Kopacki Rit, where several very rare species of ducks and herons can be observed, mostly during the migration period and in winter. However, at all Slavonian fishponds, as well as in Legrad on the Mura estuary, where it flows into river Drava, hunters from abroad, especially from Italy, are allowed to hunt protected bird species uncontrollably and illegally. This is happening in cooperation with local hunters and the same thing is going on in many other regions, above all at privatised fishponds. Birds are hunted with the help of sound baits, nets, and traps, or shot down with lead birdshot. Plastic and even living ducks are also used as baits. In principle, the Hunting Law prohibits these methods, while its violation is - though only theoretically - regulated by the Ordinance on Damage Compensation (N.N. 84/96). Moreover, those who hire game preserves compensate for the high prices and costs of keeping the game by allowing Italian hunters to hunt protected bird species. Croatia has signed the CITES convention on trade with protected species, but the authorities are still doing nothing in order to prevent the massacre. These birds, some of which weigh less than an ounce (! 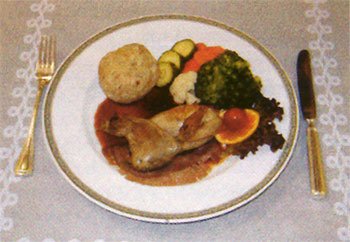 ), end up as delicacies on the menus of prestigious European restaurants. What is the Price of Poaching? Apart from the reports of local witnesses, the statistics of Croatian, Slovenian, and Italian customs reveal the terrible proportions of bird killing. Thus, in the autumn of 2002, Croatian customs officers confiscated a huge number of dead birds. 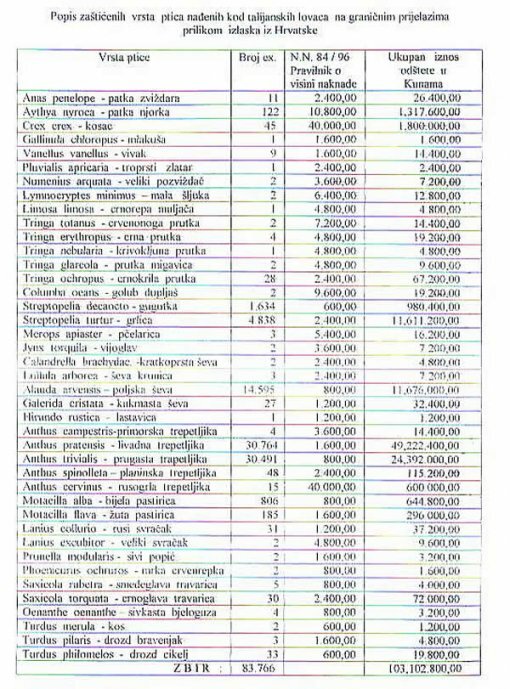 For example, the list of protected birds that were found in the trunks of Italian hunters at the border crossings of Croatia numbered 85,488 birds - the total compensation sum amounted to almost 14 million Euro, and for the total amount of smuggled birds, the compensation value would be 70 million Euro! That sum is obtained only by multiplying the number of birds, estimated according to the species, with the value of that species, without adding any other transgression fees. Customs authorities state that only 20% of confiscated birds have been identified, while only 10% of exported birds have been confiscated in the first place! 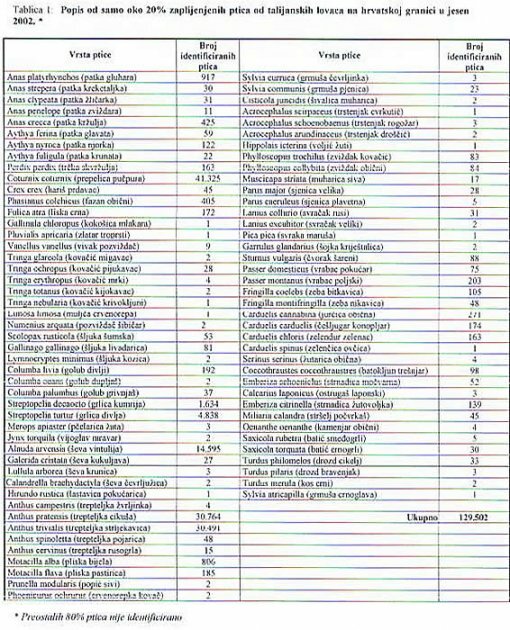 These figures tell that poachers kill millions of birds in Croatia every year, which is implicitly tolerated by the so-called hunters' lobby. That is a terrible blow to the efforts made throughout Europe to protect migratory birds and an even greater blow to our nature. 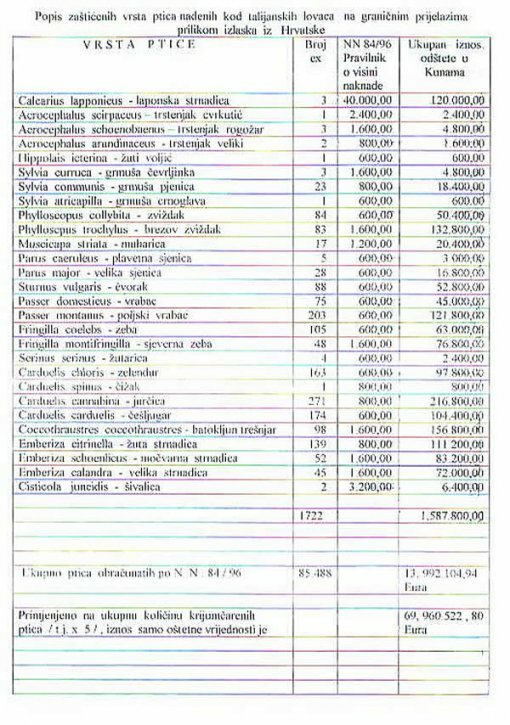 Despite this generally known and sad fact, neither the Croatian Hunters' Association, nor the Institute for Ornithology at the Croatian Academy of Sciences and Arts have ever reacted to this case of poaching, while the repeated appeals of the head of Euronatur (European Foundation for Natural Heritage), dr Martin Jacoby Schneider, to the Ministry for Environmental Protection has remained unanswered. Moreover, in the frontier areas between Croatia and Hungary, edges of fishponds overgrown with wetland vegetation are systematically "cleared" in the midst of bird nesting period - at Donji Miholjac before the eyes of the announced representatives of Euronatur - whereby the reed is covered with the material from the ground of the lake and eggs or barely nested chicks are buried alive. This procedure destroys numerous nests of birds that lay their eggs in the reed. Laws on nature protection prohibit such activities, which have serious consequences for the local bird population, since they lead to biological catastrophe. Making this alarming state of things public in the local press has resulted in severe attacks on the local protectors of birds. A small house, where students can work and lodge while they stay in the area for reasons of research, has been demolished more than once, while the head of the protection group at Donji Miholjac is forbidden to access the surfaces used by the fishpond and even to supply additional food to hundreds of swans that winter there. Not a single load confiscated at the border crossing had proper documents for exporting the species that were found and the fact that the dead birds were hidden shows that the criminals were well aware of the nature of their deed. It should be added that Slovenian customs officers had been catching Italian poachers weekend after weekend, even though the Croatian ones knew about them from the very first case. This sort of criminal activity has been going on for years and the authorities literally permit such disasters and even encourage them with their lack of responsibility. Accusations voiced by some experts, namely that certain persons in charge have been intentionally collaborating with Italian poachers for reasons of personal interest, cannot be excluded. Italian hunters usually try to deny their responsibility by saying that they have caught the birds elsewhere and are only passing through Croatia. Ornithologists from Vojvodina have established that the hunters visit frontier places in Romania and the neighbouring towns on the other side of river Sava in order to buy cheap certificates and other blank documents related to hunting and the origin of game. After that, they try to smuggle Croatian game across the border, saying that they are only passing through. Moreover, they claim that they hunt birds along the Danube, which means destroying the bird population related to Kopacki Rit, since they are shot while naturally moving through the neighbouring biotopes of the most valuable natural resource of Croatia. Experts who know the terrain and the state of Croatian ornitho-fauna are of the opinion that the hunting is taking place in cooperation with local associations of hunters and with the use of prohibited devices, such as nets, sound baits and visual baits, various traps, etc. Without cooperating with the local authorities and hunters' associations, that would not be feasible. As for crossing the state borders with animals that are included in the list of hunting game, one needs a veterinary certificate and the so-called EDP-1 form, as well as the certificate of origin, and those of the Italian poachers were not issued in Croatia. Legally speaking, such export of animals is a criminal deed, a fact that was obviously known to the Slovenian customs officers. Besides, if thousands of birds are being shot, it is strange that so much shooting does not cause any reaction of the police, the hunters' associations, and ordinary citizens. It is hardly possible that such activities would remain unknown to the district inspectors for hunting and those in charge of nature protection. 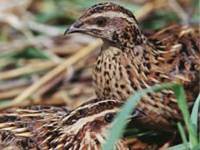 How can the Slavonian game inspectors go unpunished if they persistently claim that the Italian catch contained only 'permitted' quails, while the search revealed numerous protected species? The tragedy is even greater because many of the bird species in question are on the red list of endangered species, since they have become very rare or even disappeared in urbanised Europe and are in great danger of extinction. In the case of confiscation of dead birds at the Slovenian border on 24 October 2002, inspectors in charge of nature protection at the Ministry of Environment Protection and Zoning were the ones to inform the Croatian Ministry of Inner Affairs. On that day, the mentioned inspectors participated in the procedure of identifying the species of dead birds at the Slovenian border crossing of Obrezje, but as private persons. Owing to them, contact was established between the Croatian Ministry of Inner Affairs and the relevant Slovenian authorities. It was agreed that the results of the investigation should be forwarded to the Croatian police through the Interpol and that inspectors in charge of nature protection and the Croatian State Inspectors should also be informed. All those who have contributed to this state of affairs should be called to account. It must be established what has been done in the past three years in order to put an end to the arbitrariness of Italian poachers, who keep devastating habitats of birds in Croatia and additionally misbalance the endangered eco-system, and who will take decisive measures in order to stop this sort of crime against nature. The untouched nature, which will remain preserved in all its variety and beauty only if properly protected, is a decisive precondition for the development of eco-tourism. North-eastern Croatia, with its damp forests on the non-urbanised shores of rivers Mura, Drava, and Sava and the huge fishponds with abundant bird life, has an extraordinary natural beauty. These specificities are the only potential on which tourism could be based as an additional source of income for the local population. Protection and permanent protection of these natural resources, instead of devastation and killing, are the necessary preconditions for the development of this region, which those in charge of political decisions should recognise and act accordingly.